Laurie Smith knows the geometric design systems used in medieval England. He writes and teaches about geometry. 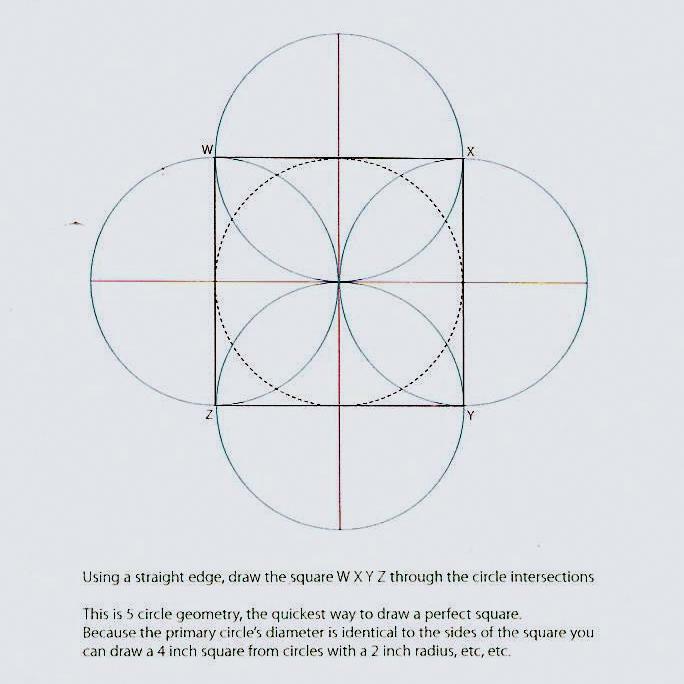 Here - as a quick introduction to his websites - is the last page of 4 of his diagram showing how to draw a square using a straight edge and a compass. It is a beautiful drawing, easy to read on his website, hard to reproduce here. His explanation at the bottom is also beautifully clear. The masonic guilds of medieval Europe passed down the methods of construction and the geometry used with diagrams and hands-on explanation. They did not use paper - it was barely available - and thus left notations on the buildings as decorative carvings and casual sketches, information we often don't recognize as the language of construction. Laurie can read and translate the notes. He is one of the people in Europe researching, documenting, and teaching about medieval framing. I suggest all those who dismiss the idea of Practical Geometry read his websites. 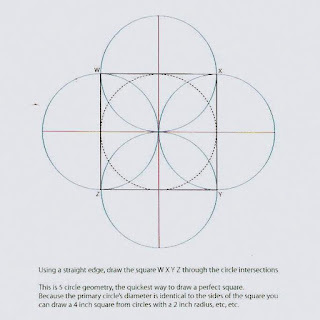 Those who wish to learn how to use Practical Geometry can be inspired by the diagrams as they follow his instructions. I have attended his lectures. and was fortunate to be able to take a workshop with him at Trillium Dell Timber Frames in Knoxville, Illinois. We built a timber frame pavilion from scratch using geometry. Here is Laurie consulting - in the blue shirt in the middle - as we work around him. Laurie drew, taught and advised. The photograph shows Laurie's diagrams for the frame posted on the wall as one of us begins the fashioning of joints. The frame, composed of overlapping squares was also laid out on the floor with chalk and a compass. A view of the mortise I helped cut as part of a 2 woman team. It fit into the frame on the first try. We finished erecting the frame one evening at dusk. Of course we all climbed into it to sit for a formal portrait. * To see the whole project and the finished pavilion look for "Appleton Octagon Pavilion, Illinois, USA" in Laurie Smith's Historic Building Geometry website listed above.